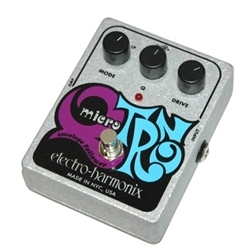 The Electro-Harmonix Micro Q-Tron Envelope Follower Effects Pedal is everything you love about the Mini Q-Tron, in an even smaller, rounded-corner die-cast case! The Micro Q-Tron is a unique type of sound modifier, in which the user's playing style controls the effect. The volume of the input signal (also called the envelope) controls the cutoff frequency of a swept filter. As the volume increases or decreases, so does the pitch of the filter. The Micro Q-Tron's effect is controlled by the user's playing dynamics - a stronger attack will yield a more dramatic effect, while softer playing will produce more subtle effects. Use the full range of control settings in combination with different playing techniques to obtain a number of different and unique effects combinations. Drive Control - The filter sweep sensitivity control. Determines the width of the filter's sweep range by the input signal. Produces more sweep when it's turned clockwise. Q Control &ndash Determines the frequency peak of the filter. Creates a more dramatic effect when turned clockwise.